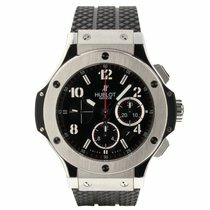 The Hublot Big Bang Chronograph is a 44mm example of the Art of Fusion. Stainless steel case lateral black Kevlar inserts with a black rubber strap. Fixed stainless steel bezel. Black dial with lumious hands and alternating Arabic numeral and stick hour markers. Minute markers around outter rim. Dial Type: Analog. Luminescent hands and markers. Date displays between the 4 and 5 o'clock positions. Chronograph - three sub-dials displaying: 12 hours, 30 minutes, small seconds. Automatic movement with a 42-hour power reserve . Scratch resistant sapphire crystal. Transparent case back. Case diameter: 44 mm. Case thickness: 14.5 mm. Deployment clasp. Water resistant at 100 meters / 330 feet. 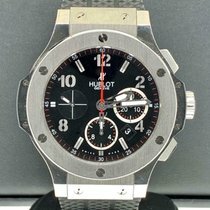 Functions: chronograph, date, hour, minute, seconds, small seconds.